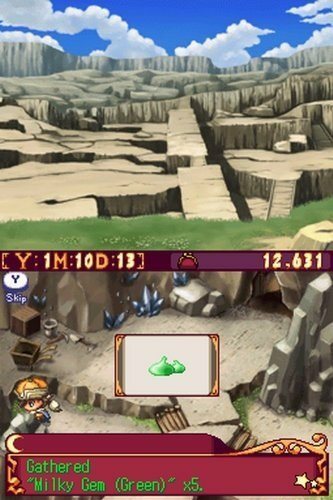 Atelier Annie: Alchemist of Sera Island is a Nintendo DS game that blends role playing elements, resource management and item crafting together to create a fun and interesting adventure. The game follows Annie who loves nothing more than dreaming about marrying into money one day. This leads her to endlessly fantasize about the possibility and living a lazy lifestyle. Of course Annie’s parents are extremely worried about her daughter so they decide to consult her wise grandfather on the best method of teaching Annie to live a normal life and to escape this cycle. Her grandfather decides to kidnap his granddaughter and bring her to Sera Island to participate in the new resort building project there. This is where the player joins the game after being woken up by Pepe the fairy who assists the player in learning alchemy in order to construct the resort. During this adventure players will help Annie learn the value of hard work, engage in alchemy, make new friends, challenge rivals and even own her own shop on the resort. Gameplay in Atelier Annie: Alchemist of Sera Island blends elements of simulation and role playing. Much of the game revolves around questing and battling which Annie engages in while searching the wild for alchemy ingredients. These ingredients are split into basic and more advanced items which can be synthesised together with Alchemy to create new items. Twice during each game year Annie will get the chance to compete against others and demonstrate what she has learned in Alchemy in order to acquire additional funds for the resort. Players are limited to only building 5 resort buildings and with 10 options available you’ll have to replay the game at least twice to use them all. 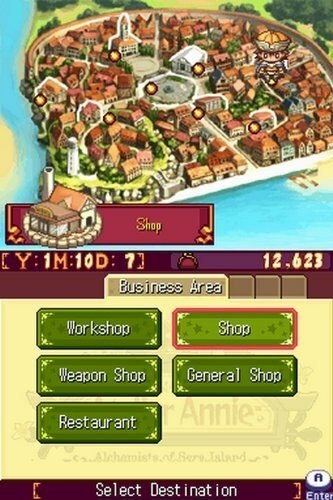 Each of these attractions requires players to choose a shop owner to manage them with certain individuals being more skilled at running particular attractions. This mixture of game mechanics eventually ends in a total of seven different endings based on your performance throughout the game and any accomplishments. Interesting mix of alchemy, combat and resort building. Very unique setting and story. Lots of different mechanics to learn and master. Available for the Nintendo DS. Multiple endings gives you a sense of purpose and impact on the result.